In February, I went to Modern Homebrew Emporium in Cambridge, MA and placed my order for hops rhizomes. Figuring that this would be a muti-year effort, I decided to start by ordering one each of Cascade, Fuggle, and Goldings rhizomes and see how things went. The hops rhizomes arrived in late March. I had grand plans for how I would go about planting my rhizomes, but regrettably April found me down with a leg injury for a few weeks. 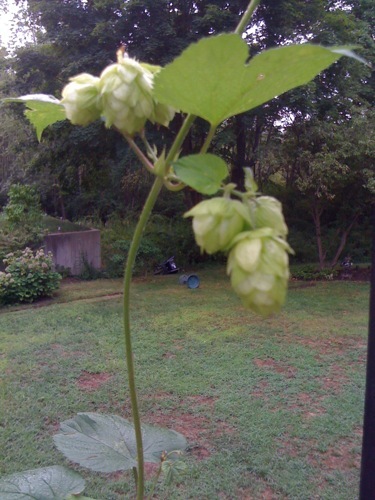 The end result of this was that my hops did not find their way into the ground until late April. When I finally planted the rhizomes I was still suffering from limited mobility, so I chose to put them into above ground planters and let them glow up the side of our deck. The Goldings grew with great gusto, but basically ran out of space to grow higher up and just did not really flower. In fact, I find it doubtful that I will end up with anything in the way of a Goldings harvest. I was somewhat luckier with the Cascade. The vine grew slowly and looked a bit weak, but at least it flowered. The hops are not altogether plentiful, but at least there will be some Cascade hops to harvest.